“Watchmaking is not a technology, it is a craft, something you do with your hands. In the hands of the great masters it becomes art.” George Daniels in A Master Watchmaker and His Art by Michael Clerizo. It is a privilege and an honor for us to offer you, what we consider to be George Daniels’ greatest masterpiece, a watch of incomparable beauty, elegance and harmony. A watch whose historical importance and relevance cannot be underlined enough. A watch fully hand-made by one of the greatest watchmaking geniuses to have graced the 20th century. Nothing destined young Daniels to become one of the most prominent names in watchmaking, yet, an encounter with a pocket watch at the age of five would not only change his life but watchmaking as we know it today. The movement of that watch opened up unfathomable possibilities in the small child’s brain and magic happened. Wishing to free himself from an early life of poverty, and after having worked for a short time in a mattress factory, Daniels’ horological career began as a trade watch repairer, a skill that was self-taught. In his autobiography All in Good Time, Daniels’ wrote of that period “I resolved never again, except by force of law, to follow a path that did not appeal to me“. And never did he have to. Shortly after WWII, Daniels set up his own workshop repairing watches and, in his spare time, restoring automobiles for himself. However, a turning point in his life came in 1960 when he met Cecil ‘Sam’ Clutton. Sam was, like George, a connoisseur of vintage cars, but he was also a man with an impressive antique watch collection, and with many connections to other horological collectors and institutions. These connections provided superb watches, by some of the greatest past makers, for Daniels to study and work on. The late 1960s began to see the arrival, en masse, of inexpensive electronic and quartz watches. They were objects that held no fascination for Daniels. He was so disillusioned about their arrival that he briefly considered abandoning watch repair in favor of automobile restoration. But he was saved by Abraham-Louis Breguet; Daniels held Breguet in exceptionally high esteem, citing him as his single greatest influence. Over time he became a renowned expert on Breguet’s work and wrote the definitive book on the company. Daniels embarked on his first creation in 1968; a gold and silver cased 1-minute pivoted detent chronometer tourbillon with retrograde hour indication. The elegant form, simplicity, equilibrium and legibility of the dial were to become distinctive characteristics of the Daniels oeuvre. For Daniels a watch had to be historic, intellectual, technical, amusing and have useful qualities, a mantra that he applied to all his creations. From the outset, Daniels closely adhered to these prerequisites when designing and constructing his watches. He frequently repeated this mantra when discussing his watches and explaining what he was trying to achieve. The case, dial and movements of his watches were to be instantly recognizable as a Daniels, each was to be hand-made to the highest standards, and the movements were to incorporate interesting and innovative mechanical features. Daniels rarely worked on commissions and sold watches only when they were finished. The connoisseur chosen for his very first watch was Sam Clutton who said of it “That one man could have the intellectual ability to design such a mechanism; the technical ability to execute it with an exactitude second to almost none of the great masters of the past; and the artistic ability to endow it with such a strikingly elegant appearance; seems an almost incredible assembly of talent and perseverance”. The following eight watches by Daniels, constructed between 1970 and 1975, were evolutions of the 1-minute tourbillion with spring detent escapement. The last of the series included a fifteen second remontoire and equation of time indication. Daniels creative genius eventually led him to his first escapement invention – the Double wheel chronometer escapement. This escapement had the advantage that impulse is delivered directly to the balance, with no lubrication, which in turn gives long term stability of rate. Daniels first watch in this series went to Seth Atwood for the Time Museum. Further iterations were constructed, culminating in two iconic watches known as the ‘Space Travellers’. Utilizing the two-trains that were required for the escapement, both watches displayed mean-solar and sidereal time. The design and reliability of the Double wheel chronometer escapement became the inspiration for Daniels second escapement invention – the Co-axial. Legend has it that Daniels awoke in the middle of the night in 1975 with the exact image of what this escapement was to look like. Considered as one of the greatest innovations in horology of the past 250 years, the Co-axial is a modification of the lever escapement with some features of the detent escapement. It functions with a system of three pallets that separate the locking function from the impulse, avoiding the sliding friction of the lever escapement. This makes lubrication of the pallets theoretically unnecessary and thereby minimizes one of the shortcomings of the traditional lever escapement. The Co-axial was fitted to five Daniels watches created between 1975 and 1986, all of which proved to be excellent timekeepers. During this period Daniels approached the Swiss watch industry with a view to incorporating the Co-axial escapement as an alternative to the lever escapement in a wrist-watch. In 1999, Omega agreed to adopt the Co-axial, subsequently investing significantly in it, to enable its adoption. Today the Co-axial is used in a large part of Omega’s current wristwatch collection. 1999 also saw the introduction of the Daniels Millennium wristwatch, a limited series of watches also incorporating the Co-axial. These were constructed by Daniels and his protégé Roger Smith. Two additional ingenious pocket watches were conceived and completed by Daniels, a four minute tourbillon with compact chronograph, and the most ambitious and complex watch he ever made, the Grand Complication. A mechanical tour de force, the Grand Complication stands apart in the Daniels production. Fully hand made, it is the only Daniels timepiece to feature an instantaneous perpetual calendar with retrograde date and minute repeater, both mechanisms to Daniels’ own design. 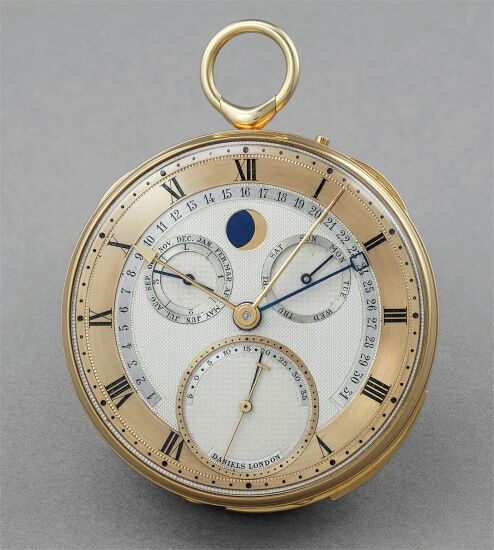 The sublime layout of the engine-turned dial, and the finesse of the gold case and gilt movement show the artistry of the maker, combining the majority of the complications incorporated in his earlier watches: moonphase, differential screw mechanism for the reserve of winding, bimetallic centigrade thermometer, Daniels keyless pendant and bow, co-axial 1-minute tourbillon, and annual calendar with kidney cam and equation of time indication. The Grand Complication was retained by Daniels for his personal use and was never sold during his lifetime, further underlining the special significance of this watch. That this watch also incorporates the Daniels Co-axial escapement further elevates this timepiece to an even greater level of historical importance. The influence of George Daniels as a pioneer, and the founding father of modern independent watchmaking, cannot be emphasized enough. Through his watches and publications, particularly Watchmaking, he has and continues to inspire countless international independent watchmakers to follow their dreams and create their own watches and ethos. For a collector of independent horology nothing is more exclusive than to own a George Daniels watch. The present lot is of huge historical importance and represents the absolute pinnacle of his oeuvre. We would like to thank David Newman of The George Daniels Educational Trust, Roger W Smith OBE of Roger Smith Ltd, Richard Stenning and Philip Whyte of Charles Frodsham & Co for their precious input, photos and sketches. Eccentric hours and minutes on lower section of dia,l sub seconds at 12 o’clock, power reserve display, Daniels Independent double wheel escapement, seconds zero reset mechanism. Key‐wound. Hours, minutes, seconds, power reserve display, Daniels compact chronograph with minute recording, Daniels slim co‐axial escapement, four‐minute tourbillon. Hinged Double‐dialed sprung case, hours, minutes, seconds and power reserve on one dial; and day, date and visible tourbillon on the reverse dial. Daniels slim co‐axial escapement, 1‐minute tourbillon.